Past work at KBS LTER examined the long-term dynamics of selected insect predator communities, primarily coccinellids and ground-dwelling carabid beetles. Current work continues to build on the existing long-term data sets and examines the population and community-level impacts of insects as invaders in agricultural landscapes. Discovered in the year 2000, the soybean aphid Aphis glycines Matsumura is a relatively new invasive pest of soybean in North America. In 2003, a study on the relative strength of top-down versus bottom-up regulation of soybean aphid at the KBS LTER showed that top-down effects predominated (Costamagna and Landis 2006). And that while several species of A. glycines parasitoids occur at the site (Kaiser et al. 2007) a community of generalist predators was primarily responsible for the top down control (Costamagna and Landis 2007, Costamagna et al. 2007). We are interested in how shifting predator and parasitoidcommunities will influence A. glycines population dynamics over longer time frames. Generalist natural enemies frequently engage in intraguild predation and these interactions are vital to understanding herbivore population regulation. In particular, asymmetrical intraguild predation interactions can disrupt or even exclude potentially effective biocontrol agents. Existing parasitoids appear to be adapting to soybean aphid and introductions of exotic parasitoids for A. glycines control have been proposed. We are interested in learning if intraguild predation reduces parasitoid survival in the field, and if establishment or eventual biological control of A. glycines is limited by intraguild predation. 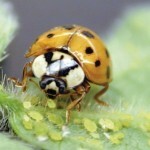 The multicolored Asia ladybeetle (Harmonia axyridis) has emerged as the dominant natural enemy of soybean aphid throughout much of the north central US and is now commonly the dominant coccinellid in a number of crops and successional habitats. As a well-known intraguild predator it has been implicated in the decline of several competing coccinellids. Our observations indicate that long term A. glycines and H. axyridis population dynamics are likely to be linked. We will use our long term data set to address hypotheses about the effects of a new invader, A. glycines, on the interactions of H. axyridis with the native coccinellid community. Costamagna, A.C., and D.A. Landis. 2006. Predators exert top-down control of soybean aphid across a gradient of agricultural management systems. Ecol. Applic. 16: 1619-28. Costamagna, A.C., D.A. Landis and C.D. DiFonzo. 2007. Suppression of soybean aphid by generalist predators results in a trophic cascade in soybeans. Ecol. Applic. 17:441-451. Costamagna, A.C., and D.A. Landis. 2007. Quantifying predation on soybean aphid through direct field observations. Biological Control 42:16-24. Kaiser, M.E., T. Noma, M.J. Brewer, K.S. Pike, J.R. Vockeroth, and S.D. Gaimari. 2007 Hymenopteran parasitoids and dipteran predators found utilizing soybean aphid after its midwestern United States invasion. Ann. Entomol. Soc. Amer. 100:196-205.